I have only previously read two books by Adele Parks so I still feel like a beginner! Both of the books I have read I enjoyed and so I really wanted to try another of her books so I have just finished her new novel Whatever It Takes. Eloise is a Londoner through and through. She has a wide group of friends and usually finds herself entertaining for them, she really is living her dream but her husband has lived Eloise’s dream for a long time now and Eloise agrees it is time for them to start living husband Marks dream and move their little family back to his family’s roots in Dartmouth. This is a big step for Eloise as this means a complete lifestyle change and also means leaving best friend Sara behind when her friend needs her close by. Eloise is looking forward to being closer to her mother in-law Margret but it’s not long after they arrive that they start to notice that Margret is becoming more than a little forgetful. Eloise finds herself trying to adapt to her new life in Dartmouth but is finding she is trying to help everyone around her with their problems but for Eloise who likes everything perfect she may need to face facts that she may not be able to fix everything. Whatever It Takes is a very emotional book which tackles a number of deep issues such as Alzheimer’s and fertility problems all which are common health problems in day to day life so it was clear that this book was going to be far from a light hearted read. Eloise was a very loveable and caring character, one of these people who are so kind they don’t see any bad in any one. She loves her life in London but she understands that it would be a nicer way of life for their three daughters to live in Dartmouth and she knows it means a lot for Mark to be closer to his parents so she sacrifices her dream to please her family. Sara who is Eloise’s best friend (although I really don’t know how!) is far from a loveable character she is a very negative, selfish and most of all jealous character. Sara is desperate or a baby but she has fertility problems and it just doesn’t look like she will become a mum any time soon, now usually hearing this I would be so heartbroken for anyone in this situation and rightly so but I didn’t feel any kind of sorrow for Sara. I didn’t even feel as if it was a true longing for a baby I think it was pure jealousy of what Eloise had with her girls and Sara just wanted to compete. Adele has brought the subject of Alzheimers into this book which was heart breaking but also it gave a great insight into living with someone with the terrible condition from both how Margret was feeling and also how her family around her coped. There were a few surprises along the way in this book which only added to what I can only describe as a compelling read but what really shocked me was the ending to this book I am sure there is no way that you could predict the outcome of this book the truth seemed to be right under our nose during the book and yet it is not until it is pointed out to us in black and white that the truth becomes clear which I thought was very clever. A compelling and emotional read from Adele Parks, which I thoroughly enjoyed. Great review. I do want to read it, but only when I am in the right frame of mind for it. Loved it! 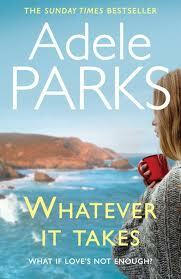 It is the first book I have read by Adele Parks. Will be reading more. Fab review, been looking for future books to read, and as I work with Alzheimer's this one seems interesting!